“There is a formal old-world elegance at Lemuria Restaurant and Wine Bar that always makes dining at one of the metro’s best so special. 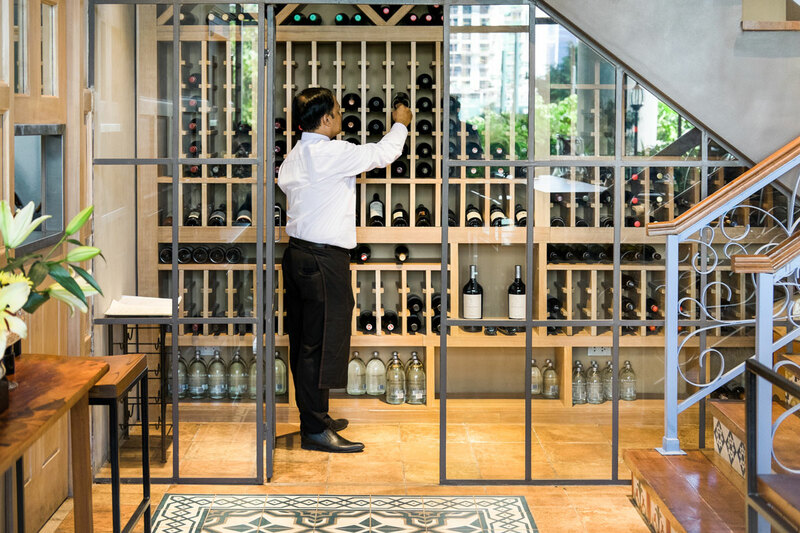 From its graceful interiors to its pristine white table linens for the dinner service, Lemuria Restaurant and Wine Wine Bar takes fine dining to Arya Plaza with its classic menu and impeccable service. From starters to mains and desserts, Lemuria Restaurant and Wine Bar lays on a class act that made it synonymous with fine dining over the years. Start with the Braised Lamb And Apricot (P 365), a savory buckwheat crepe with fork-tender pulled braised lamb in red wine sauce and apricot chutney.”…. “Everyone knows Lemuria had opened a branch in QC, but they also just opened one here in Arya Plaza. If you want to experience what fine dining was meant to be, then this is where you should be! “One of the Christmas parties I had recently were held here at Lemuria, a fine dining establishment that serves mostly French and Mediterranean cuisine. This is now their second branch, the first is a home turned restaurant in Horseshoe, Quezon City. We wanted to reserve a table at the one on Horseshoe Drive like we did last year (because we had a celestial experience) but they were closed on the date we wanted. I got a reply that they have a new restaurant in BGC. We wouldn’t have gone all the way there from Eastwood (where we live) if it were any other restaurant with a new branch… Alas! Sure, it’s at a condo building surrounded by metal towers which wasn’t what we’re looking for (somewhere hidden and unassuming) but everything was just as amazing. The staff and the service, the feel, the flavours!!! Extraordinary. No other restaurant in the metro comes close. Great food! Great service!! Very good wines!! “The name whirls me away to a romantic chateau surrounded by lush evergreen in Horseshoe Village, Quezon City. There are many important occasions celebrated in this space—anniversaries and birthdays just to name a few—owing to the restaurant’s private and intimate dining experience. News of a second branch in BGC immediately piqued my curiosity; how would Lemuria translate the exclusivity and intimacy of its restaurant in its new metropolitan neighborhood? It’s not only the food that is well prepared, the the entire dining itself. I loved the flavor viands we ate here. Had a great time in Lemuria BGC. All the staff were very accommodating and friendly. Food was exceptional also! Fave would be the chicken roulade. The steak was also okay but the potato purée that was served with it was divine! My man made a good decision on choosing this place to have our pre-anniversary dinner. Bonifacio Global City, Taguig 1162.